One of the biggest challenges of building an authentic Viking boat has always been figuring out how to maintain the historic authenticity of the centuries-old design and still be compliant with modern safety requirements. All along we have been trying to build this 38-foot boat with as many traditional Viking methods as we can but with the presumption that many of those methods were safe then and safe now. So the more evidence we gather along the way, the more we can establish some of these older techniques within the accepted boat building code. One area on which we focused has been our choice of fastener, which we had decided to manufacture by hand – like the Vikings – and use them in the same way as the Old Norse shipbuilders. And we are pleased to report that we recently crossed a big hurdle with the testing of our rivets and spikes, which were given the stamp of approval from the US Coast Guard. From a boat building perspective, it’s been a fascinating process getting to this point. The use of iron as a premium shipbuilding material began with the Viking age and survived up until the end of the 19th century. Wooden hulls held together by iron rivets gave way to wrought iron plate hulls fastened as before. The British led industrial revolution was enabled by innovations in the mass production of iron used in bridges, railways and of course larger and larger ships. Iron was eventually displaced by steel — and with it the production of high quality iron for shipbuilding faded into antiquity. The iron we use is just as strong, and in some respects better than what’s commercially available today. Our rivets and spikes are made individually by a blacksmith who melts down the iron accumulated from hundred year-old chains and shackles originally used for hauling rafts of logs down-river to the ocean from the North Western logging areas. It takes two minutes to forge a rivet, but also about ten minutes to straighten the link and prepare the rod for about thirty rivets. We anticipate having to make over 1,000 rivets before the ship is complete. 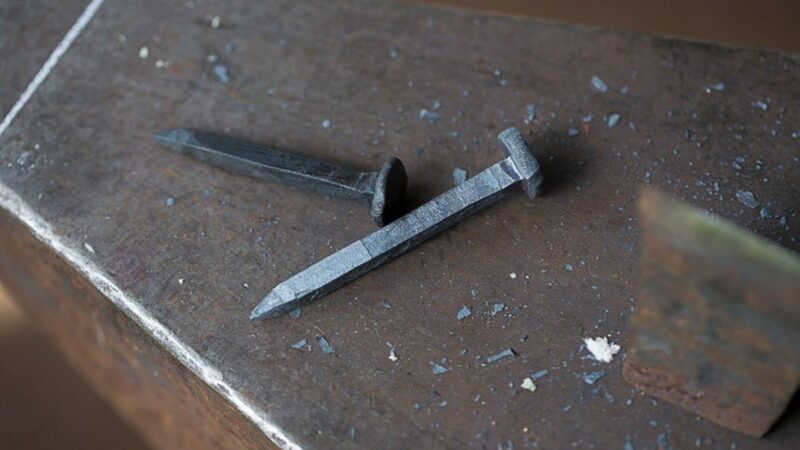 There are no standard tests for hand-made rivets so we had to invent one. 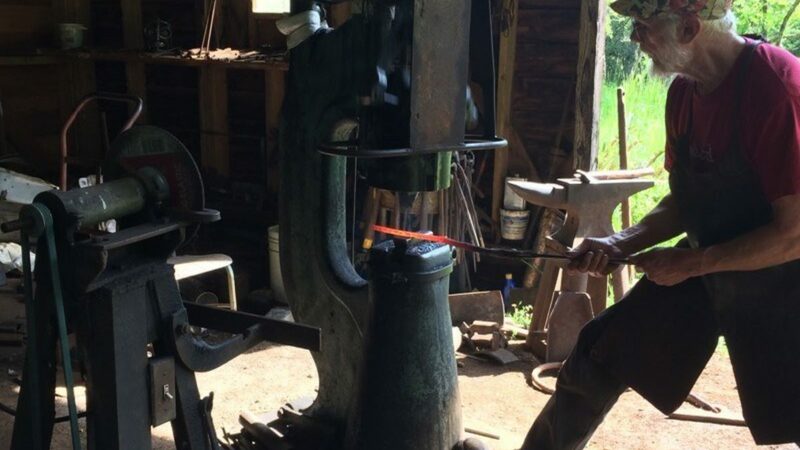 Our blacksmith had assured us of the iron fasteners’ quality, including strength and rust resistance, but despite those assurances we had to come up with a way to convince the Coast Guard of this. Under advisement from three separate US Coast Guard offices, we came up with a “pull test” method to make sure the fasteners can withstand the pressure and poundage associated with holding together a 5,000-pound, 14-passenger wooden vessel. 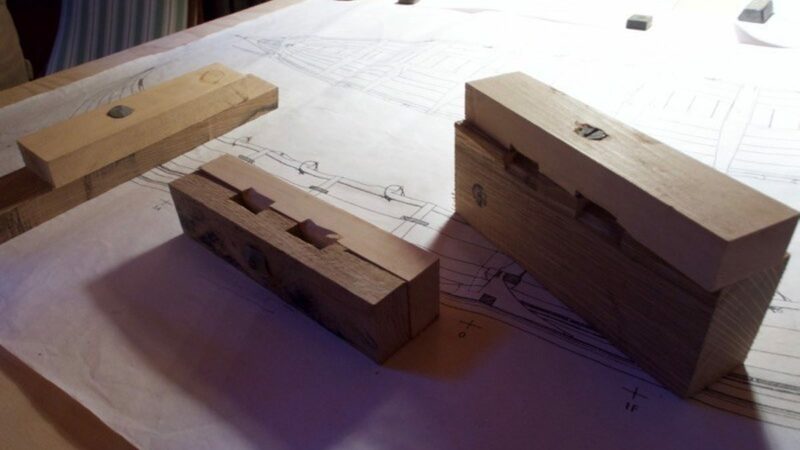 Two different types of wood are being used in the hull – white oak for the frames and yellow cedar for the strakes (planking) which ultimately form the “skin” of the boat. Samples of each type of wood were cut and fastened to one another with one of either a spike, rivet or modern galvanized boat screw. Using flat nylon webbing straps connected to a chain and pulley system, we applied a controlled amount of tension to attempt to pull the boards apart. The goal was to withstand 800 pounds of pull tension. During the pull test on the screw, the tension was raised gradually from 100 pounds to 600 pounds (measured with a dynamometer) over 60 seconds; that’s when the screws began to let go of the oak block and with further tension the yellow cedar started crushing under the screw head. To our relief, and the CG observers’ satisfaction, our chosen rivets and spikes out-performed the screws and held in excess of our target level. That was fantastic news, of course, but the Coast Guard pressed us to obtain third-party validation to get a determination of the actual breaking strength of the rivets as well as the consistency of their metallurgy. We then brought our materials to an independent lab, which conducted further pull tests and chemical composition analyses conforming to the current recognized standard testing procedures recommended by the Association of Scientific Testing Methods. The results of these scientific tests were sufficient to impress the technicians at the lab and satisfy the Coast Guard once-and-for-all and thus we got the go-ahead to use them. This milestone is significant for us: it means we can use fasteners with properties Viking metal smiths would have recognized. The old materials we are using with the Norsvald vessel don’t make sense if we were to manufacture boats in larger volumes. But when building something as customized as ours, the old ways seem to be working better. All-modern methods would result in a completely different boat being built and we would have missed out on several important aspects of traditional methods that inspire authenticity and aid teaching. First is the use of high quality materials and attention to detail; second is the strength and flexibility inherent to the way the Vikings originally constructed their boats; and third, the fact that many of these traditions disappeared over time as other factors – economic and other desires to build larger and faster vessels – took precedence. To be producing something in ways that would be completely recognizable by a boat builder from 1,000 years ago has been an awe-inspiring feeling. Just imagine the conversation we could have with the ancient boat builders who understood these challenges better than any of us! It leaves you wondering just exactly how they did it!